KATSINA ? The Peoples Democratic Party, PDP, Katsina State Chapter has accused the ruling party, All Progressive Congress, APC of vote buying in the Saturday?s bye election into the Katsina North Senatorial district seat. A The State Chairman, Salisu Majigiri made the accusation while speaking with newsmen in Daura while monitoring the conduct of the election exercise. 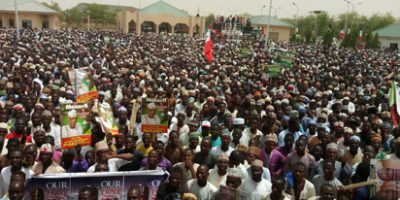 ?PDP supporters at the Katsina Rally Majigiri alleged that the APC dole out the sum of N200,000 each in the 1,825 polling unit in the senatorial district. According to him, ?My assessment is that in the morning, we witnessed the accreditation and voting. It was done simultaneously. Almost 99% of the polling units have there materials ready early except for one polling unit, Garo, Garo ward of Mashi Local government area. It was the only the polling unit that we discover that the materials were brought late at about 11am. But apart from that, election materials were brought early and the exercise went on without any hitch. But in the afternoon, that we realized there are so many vote buying going on within the senatorial district. ?We have 1,825 polling units including the voting points. No single polling unit that we didn?t get report that there was vote buying by the APC. We have our agents there and they complained to us. We complained but nothing was done. So, there was no single polling unit that there was no report of vote buying. We raised complain to the security. We have some pictures as evidence from our agents. We have our proves. ?They gave about N200,000 in each of the 1,825 polling units. We have alot to say but we are waiting for the results to be declared. ?Since they are making the same allegations, the truth will come out. After the declaration of the results, we would know who would be found wanting of this serious illegal business. ?Even if the election results came out in our favour, the APC must be punished for doing what is not good. Because we are heading to 2019 general election. We want all these behavior to be changed before the 2019 general elections. It happened in Ekiti and it?s happening in Daura zone. So we don?t know where we are heading to. In a swift reaction, the All Progressive Congress debunked the allegations by the PDP saying it is not true and that it is only a flimsy excuse. The Public Relation officer, Abubakar Gambo Danmusa said the allegation made by the PDP was like putting the cat before the horse noting that the senatorial district is predominantly Buhari. ?PDP have never won the Senatorial district since Buhari joined politics in 2003. It is not true but only a flimsy excuse. They are not prepared and didn?t filled the proper candidate for the election,? Danmusa said. Our reporter who visited some areas gathered that the exercise recorded hitch free and a mix of low and large turnout of the electorates. The 12 Local government areas under the senatorial districts which participated in the voting exercise includes Daura, Kankia, Kusada, Zango, Baure, Ingawa, Maiadua, Bindawa, Dutsi, Mashi, Mani and Sandamu. At Kanti polling unit 010, Galadima B ward, Kankia local government area, the Presiding officer, Onobia Nkemdirin said accreditation and voting commenced as early as 8am and the card reader working smoothly without any hitches recorded. At Dutsi Ward A, Polling unit 001 Primary School in Dutsi Local government area, the Presiding officer, Mohammed S. Bauchi said accreditation and voting commences as early as 8am but difficulties in the use of card reader slow down the process as it manage to operate and make use of the machine. A PDP gubernatorial aspirant in the state, Musa Nashuni after casting his vote at Kanti 010 polling unit of Galadima B Ward, said : ?So far everything is going on smoothly. But you know we will keep our eyes open until the exercise is completed before we can give a final judgment. ?But so far, with what I have seen, there is no intimidation, harassment. The turn out is good. I have not called anybody yet for reports from other local government because I am trying to cover my own local government before I call somebody else. ?The card reader is working smoothly. My own was smooth,? Nashuni said. Speaking to newsmen at his country home, Kusada, the Speaker, Katsina State House of Assembly, Hon Abubakar Yahaya Kusada expressed optimism that his party, APC will come out victorious at the end of the election. ?Generally speaking, the situation is very peaceful. The people have conducted themselves very peacefully and in an orderly manner. The election started in good time this morning and INEC have done its best by distributing the materials on time and the personnel have reported to their various destination on time. And the people turned out enmasse. ?The impression is we will win the election with a wider gap because the people are ours and they are voting for our party,? Kusada boasted. At Maiadua local government area, an APC aspirant for the Umar Yau Gwajogwajo commeneded the smooth and peaceful conduct of the election compare to previous elections held in the past. Major contenders in the election are the APC flagbearer, Ahmad Babba Kaita and his counterpart, Kabir Babba Kaita from the PDP. However, as at the time of filing in this report, election results were said to be collated at the wards, later to the local government areas for onward transmission to the Independent National Electoral Commission, INEC.